HALCYON is the answer for all Americans who want to escape, but paradise isn’t what it seems. A beautiful island in the middle of Lake Ontario—a self-sustaining community made up of people who want to live without fear, crime, or greed. Halcyon is run by Valerie Kemp, aka Mother Moon, benevolent and altruistic on the outside, but hiding an unimaginable darkness inside. She has dedicated her life to the pursuit of Glam Moon, a place of eternal beauty and healing. And she believes the pathway there can only be found at the end of pleasure. On the heels of tragedy, Martin Lovegrove moves his family to Halcyon. A couple of months, he tells himself, to retreat from the chaos and grind. He soon begins to suspect there is something beneath Halcyon’s perfect veneer and sets out to discover the truth—however terrible it might be—behind the island and its mysterious founder, Mother Moon. 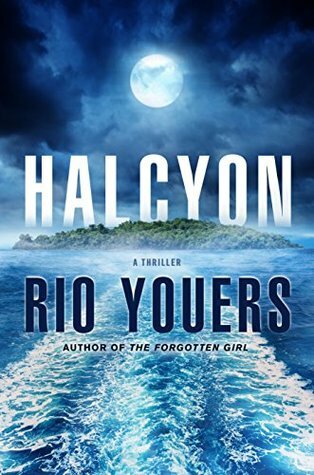 The book blurb for Halcyon by Rio Youers really seemed to skip the entire beginning of this horror/thriller read. The story begins following the Lovegrove family and also switching to the members of Halcyon’s activities. Martin Lovegrove and his wife have two daughters the youngest of which is Edith who has begun to suffer from night terrors. The family does everything they can to help Edith get through this when they discover what Edith is seeing at night is really happening around the world. During the time the Lovegrove’s are dealing with night terrors readers are also introduced to Halcyon, an island retreat that is ran by a woman named Valerie Kemp who refers to herself as Mother Moon. The members of Halcyon are those that want to escape from the horrors of the real world in this isolated society but Mother Moon has plans of her own that she hides from those coming to the island. It’s not until probably halfway into the book that the two sides of the story collide when Martin meets a man from Halcyon after his family has suffered a horrible loss. At that time he’s invited to the island to get his family away from the violence but when getting there becomes suspicious of Mother Moon. This one was a bit of a slow burner as the two sides of the story were being built and I have to say I was enjoying Edith and the rest of her family a bit more than the Halcyon side. The events happening are like those that we see in the news all too often which gave a realistic feel to the characters story as it went along. As it all comes together it began to move at a faster pace and had me more on the edge waiting to see what would happen to the characters I’d become attached to. As much as the idea of a peaceful island community sounds appealing you just know the old saying “If it sounds too good to be true then it probably is” was going to play out well in this one and the story certainly went a lot further than I expected it to leaving me to rather enjoy the creativity even in it’s cringe worthy moments. I received an advance copy from the publisher via NetGalley. RIO YOUERS is the British Fantasy Award–nominated author of End Times and Point Hollow. His short fiction has been published in many notable anthologies, and his novel, Westlake Soul, was nominated for Canada’s prestigious Sunburst Award. Rio lives in southwestern Ontario with his wife, Emily, and their children, Lily and Charlie. Nice review, but I am not sure if this is my cup of tea. I am not into horror type stories.